I was talking with my daughter the other day about Adam and Eve and the fall in the garden. She was very upset when she read Genesis 3:16. Specifically the part about "and thy desire shall be to thy husband, and he shall rule over thee." She very honestly stated that she didn't like that part. My husband and I saw this as an opportunity for a teaching moment. He asked her why and she couldn't come up with a reason she just knew that deep down in her something about that bothered her. The more we talked the more upset she became until she was in tears which broke my husband's heart. Not knowing what to say he just looked at her. I knew why this particular passage bothered her because when I was younger it bothered me as well. To this day whenever someone misinterprets this passage it still bothers me. This was a result of the fall not God's intended plan. The Bible does however talk about submission or subjection. This submission issue has been misrepresented for years. Many combine the verse in Genesis with the verses in the New Testament that deal with submission. If you take the whole Bible in context (as good Christians are taught to do) you will learn that the submission is for both the husband and the wife. They are to submit to each other. Not one to "rule" the other. You see if you take scripture in its entirety you know that God's intention is not to put one human being above another and if somehow you missed that all you need to do is read James 2, Romans 12, or Philippians 2. In my head I was trying to figure out how to explain to my daughter what God meant by this passage. That is when God gave me the wisdom I needed for the situation! My daughter loves rainbows. She has loved them since she was little. She is also very strict about portraying the rainbow. You see the rainbow has a certain order to its colors. That never varies - R.O.Y. - G. - B.I.V. (red, orange, yellow, green, blue, indigo, and violet) Anytime someone gets the order wrong it really ruffles her feathers to the point that she can't help but to verbally correct them. This has been the case with her since she was very little. 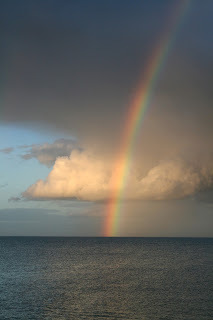 God showed me that the rainbow could be used to teach her what He meant! The rainbow has this order and the only time it gets out of order is when man tries to recreate the rainbow himself using his own rules. Which color in the rainbow is the most important color? She looked at me puzzled as this question seemed completely off topic to her. I repeated the question. She answered none of them. They are all the same. He is a God of order. He set things in a certain order so that He would be glorified. He didn't set men as the head of the household so that men would be more important but rather because that is the order that would best glorify Himself.